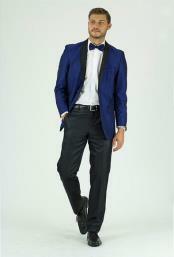 Flaunt a royal look for occasions that require a special dress up by getting dressed in a royal blue colored outfit. 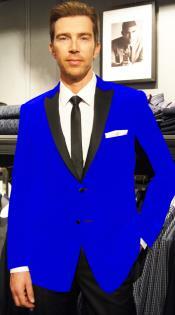 The color royal blue resembles the shade of ink blue. 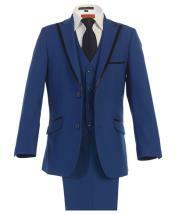 Bright and attractive in appearance, the royal blue colored outfits are sure to make you look stylish and unique. 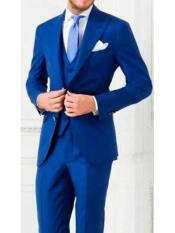 This color is common yet unique, and blends well with many colors for contrasting options. 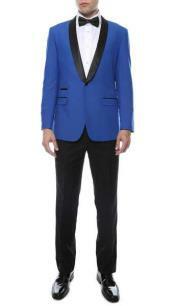 Pair up a royal blue tuxedo with a matching white dress shirt. 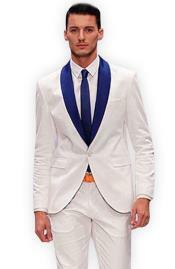 You can choose to have clean and crisp looking white cuffs that look complimenting with the royal blue colored tuxedo jacket. 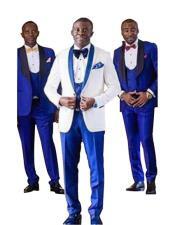 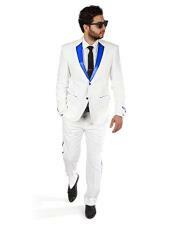 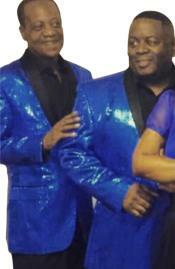 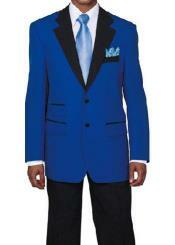 A white and royal blue men's tuxedo is a complete look in itself. 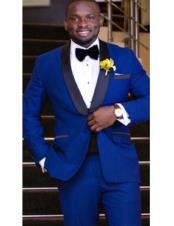 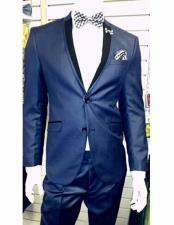 A royal tuxedo for men in blue shade not only suits day events, but is also suitable for evening events and night parties and events like dinner dates, prom nights and so on. 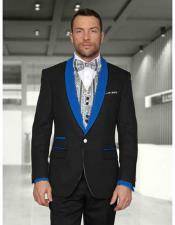 Apart from the white combination, a royal blue color blends well with a black shade too. 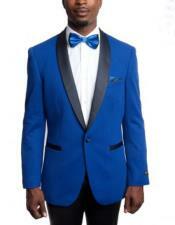 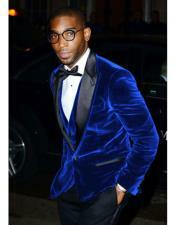 A black and royal blue tuxedo gives an overall royal tuxedo look. 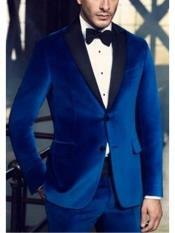 Black being a dark shade and the royal blue being a bright and attractive color makes an excellent match. 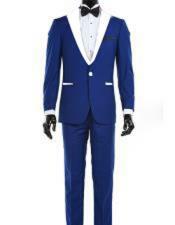 Apart from the black and white color combination options, the royal blue color also blends well with the silver color. 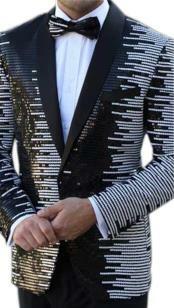 This is a unique match in itself. 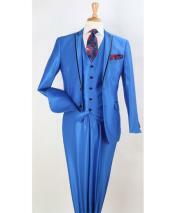 Occasions like prom nights, weddings and summer balls are best to wear such a unique color combination option. 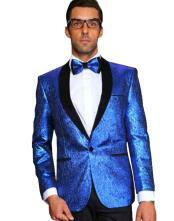 Wear a royal blue and silver tuxedo and flaunt a unique style and trend in your looks. 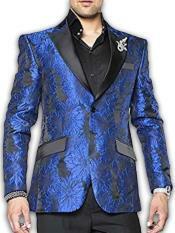 This combination of the color silver with a shade of royal blue is unique and hard to spot; hence wearing such a combination will definitely make you stand apart in a crowd. 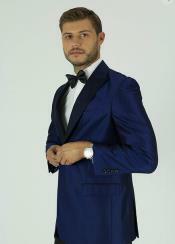 Make a style statement and look ahead of style in a classic silver with royal blue men's tuxedo suit. 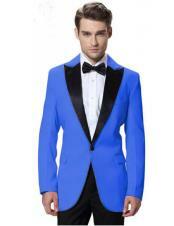 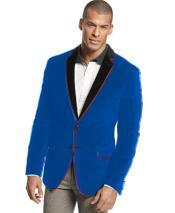 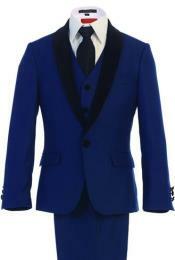 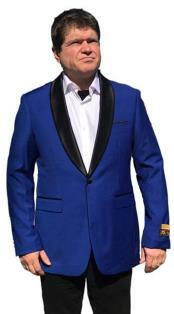 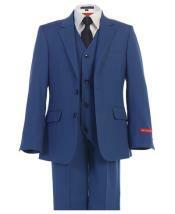 Browse this category to shop for the great royal blue collection in men's suits and tuxedos. 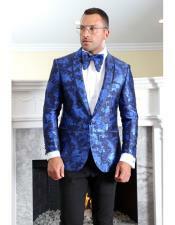 You will find royal blue dress shirts, royal blue men's shoes, royal blue neck ties, bow ties in royal blue and much more. 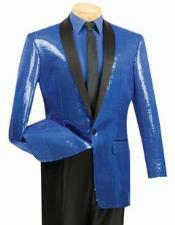 The royal blue and white tuxedo jacket can be worn as a separate outfit, sometimes pairing it up with dress shirts and sometimes with a casual t-shirt. 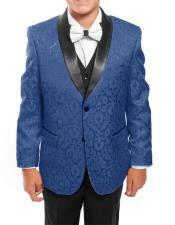 In addition to different shades in royal blue men's tuxedos and suits ranging from the darkest to the lightest shade, you will also find different fabric options in men's royal blue tuxedos and royal blue suits. 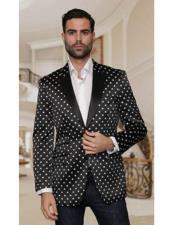 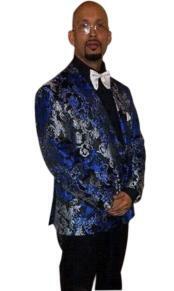 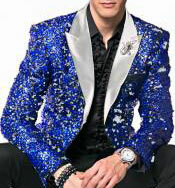 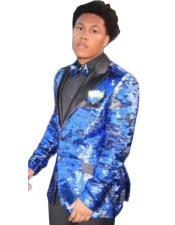 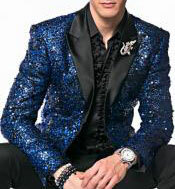 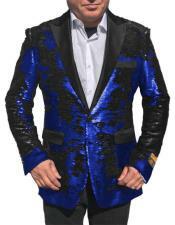 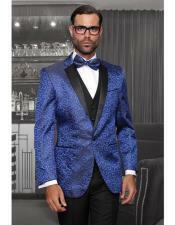 You can now shop for shiny sequin patterns and paisley print royal blue tuxedo suits and royal blue tuxedo jackets for men online. 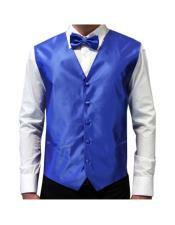 In addition to royal blue suits and tuxedos, you will also find royal blue tuxedo pants, royal blue dress pants, royal blue slacks for men at our one stop online store.